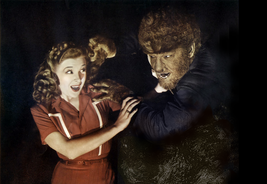 Promotional image featuring Evelyn Ankers and Lon Chaney Jr.
Lon Chaney Jr. would reprise his classic role as "The Wolf Man" in four sequels, beginning with Frankenstein Meets the Wolf Man in 1943. That night, Larry attempts to rescue Gwen's friend Jenny from what he believes to be a sudden wolf attack. He kills the beast with his new walking stick, but is bitten on the chest in the process. A gypsy fortuneteller named Maleva (Maria Ouspenskaya) reveals to Larry that the animal which bit him was actually her son Bela (Bela Lugosi) in the form of a wolf. She also reveals that Larry will transform into a wolf as well since he who is bitten by a werewolf and lives will turn into one himself. Talbot transforms into a wolf-like creature and stalks the village, first killing the local gravedigger. Talbot retains vague memories of being a werewolf and wanting to kill, and continually struggles to overcome his condition. He is finally bludgeoned to death by his father with his own silver walking stick after attacking Gwen. Sir John Talbot watches in horror as the dead werewolf transforms into his son's human form. Gwen notices as well and cries for her friend's condition as the local police arrive on the scene. The poem, contrary to popular belief, was not an ancient legend, but was in fact an invention of screenwriter Siodmak. The poem is repeated in every subsequent film in which Talbot/The Wolf Man appears, with the exception of House of Dracula and Abbott and Costello Meet Frankenstein, and is also quoted in the later film Van Helsing, although many later films change the last line of the poem to "And the moon is full and bright". In episode 944 of Dark Shadows, Christopher Pennock (as Jeb Hawkes) recites this version of the poem. The original Wolf Man film does not make use of the idea that a werewolf is transformed under a full moon. Gwen's description and the poem imply that it happens when the wolfbane blooms in autumn. The first sequel, though, made explicit use of the full moon both visually and in the dialog, and also changed the poem to specify when the moon is full and bright. Presumably this is what popularized the full-moon connection in the 20th century. The sequel visually implies that the transformation occurs as a result of direct exposure to light from the full moon. Other fiction has assumed the transformation is an inescapable monthly occurrence and does not examine whether it is caused by light, tidal effects, or some cycle that happens to coincide with the moon's phases. In the original film, Chaney did not undergo an on-screen facial transformation from man to wolf, as featured in all sequels. The lap-dissolve progressive make-ups were seen only in the final ten minutes, and then discreetly. In the first transformation, Talbot removes his shoes and socks and it is his feet which are seen to grow hairy and become huge paws (courtesy of uncomfortable "boots" made of hard rubber, covered in yak hair). In the final scene, the werewolf does gradually return to Larry Talbot's human form through the standard technique. Stories about the make-up and transformation scenes have become legendary, and are mostly apocryphal. The transformation of Chaney from man into monster was certainly laborious. The series of makeups took five to six hours to apply, and an hour to remove. Jack Pierce had originally designed it for Henry Hull in Werewolf of London (1935) but Hull argued that the disguise made no sense within the plot, since two characters had to recognize "Dr. Glendon" even in his werewolf form. Pierce was ordered to design a second version which left more of Hull's face recognizable. Pierce then recycled his original design for the 1941 film. Chaney claimed he was forced to sit motionless for hours as the scenes were shot frame by frame. At times he claimed he was left to remain sitting while the crew broke for lunch and was also equivocal about using the bathroom. Chaney even went as far as saying special effects men drove tiny finishing nails into the skin on the sides of his hands so they would remain motionless during close ups. However, there may be some exaggeration involved - studio logs indicate during the filming of Abbott and Costello Meet Frankenstein (1948) the entire crew, including Chaney took a two-hour break during the filming of a transformation and filmed the rest of the scene later that day (though the makeup for Abbott and Costello Meet Frankenstein had been greatly redesigned and streamlined by Bud Westmore over the original Jack Pierce makeup). What really happened was a plaster mold was made to hold his head absolutely still as his image was photographed and his outline drawn on panes of glass in front of the camera. Chaney then went to makeup man Jack Pierce's department, where Pierce, using grease paint, a rubber snout appliance and a series of wigs, glued layers of yak hair to Chaney's face. Then Chaney would return to the set, line himself up using the panes of glass as reference and several feet of film were shot. Then Chaney would return to the make-up department, a new layer was applied, showing the transformation further along, then returned to the sound stage. This was done about a half-dozen times. Talbot's lap dissolve transformation on screen only took seconds, while Chaney's took almost ten hours. The film was released on Blu-ray Disc in 2012 as part of the Universal Classic Monsters Collection, alongside many other classic Universal horror films (including Frankenstein, The Mummy, and The Invisible Man). On Rotten Tomatoes, the film holds an approval rating of 94% based on 35 reviews, with a weighted average rating of 7.8/10. The site's critical consensus reads, "A handsomely told tale with an affecting performance from Lon Chaney, Jr., The Wolf Man remains one of the classics of the Universal horror stable." Author and film critic Leonard Maltin awarded the film 3.5 out of 4 stars, calling it "One of the finest horror films ever made". In his review, Maltin praised the film's make-up effects, atmospheric music, and Chaney's performance. The Wolf Man is the only Universal monster to be played by the same actor in all his 1940s film appearances. Lon Chaney Jr. was very proud of this, frequently stating in interviews, "He was my baby." It is listed in the film reference book 1001 Movies You Must See Before You Die, which stated that the film 'still remains the most recognizable and most cherished version of the [werewolf] myth'.The Wolf Man was not Universal's first werewolf film. It was preceded by Werewolf of London from 1935, starring noted character actor Henry Hull in a quite different and more subtle werewolf makeup. As noted previously, Hull objected to having his face entirely covered in latex and hair, and a less-hirsute, more devilish version was used in the film. The film was not a huge box office success, probably because audiences of the day thought it too similar in many ways to Dr. Jekyll and Mr. Hyde, for which Fredric March had won an Oscar three years before. Some latter-day critics prefer Henry Hull's earlier werewolf to Chaney's, which was described in Carlos Clarens's book An Illustrated History of the Horror FIlm as "... looking like a hirsute Cossack." The Wolf Man is one of three top-tier Universal Studios monsters without a direct literary source. The others are The Mummy and the Creature from the Black Lagoon. In the 1970s, novelizations of the original films were issued as paperback originals as part of a series written by "Carl Dreadstone," a pseudonym for British horror writer Ramsey Campbell. The resurrected Talbot seeks out Dr. Frankenstein for a cure, but finds the monster (Bela Lugosi) instead. The two square off at the climax, but the fight ends in a draw when a dam is exploded and Frankenstein's castle is flooded. In House of Frankenstein (1944), Talbot is once again resurrected and is promised a cure via a brain transplant, but is shot dead with a silver bullet instead. He returns with no explanation in House of Dracula (1945), and is finally cured of his condition. But he was afflicted once again, in the comedy film Abbott and Costello Meet Frankenstein (1948). 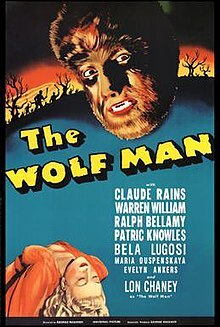 This time the Wolf Man is a hero of sorts, saving Wilbur Grey (Lou Costello) from having his brain transplanted by Dracula (Bela Lugosi) into the head of the Monster (Glenn Strange). Grabbing the vampire as he turns into a bat, the Wolf Man dives over a balcony into the sea, taking Dracula with him. Universal Pictures produced a remake of The Wolf Man with Joe Johnston directing the film and Benicio del Toro starring as Lawrence Talbot (also producer of the film). The remake followed the same basic plot of the original but the story and characters were significantly altered, with Anthony Hopkins in a radically altered version of the Claude Rains role. The film was released on February 12, 2010 and opened at #2 at the box office that weekend. The film was met with mixed reviews and a low box office reception but won an Academy Award for Best Makeup in 2011. Due to the 2010 remake performing below expectations at the box office, Universal chose not to produce a sequel. Universal's 2012 film Werewolf: The Beast Among Us was originally planned as a spin-off from The Wolfman but was ultimately unrelated. Universal announced that it would reboot their Universal Monsters properties as part of their Dark Universe, with Alex Kurtzman and Chris Morgan attached to develop the structure of the shared universe. In November 2014, Universal hired Aaron Guzikowski to write the shared universe's reboot of The Wolf Man. In June 2016, Deadline reports that Dwayne Johnson may star as the character. In October 2016, it was reported that David Callaham was brought on board to re-write the script. But on November 8, 2017, Alex Kurtzman and Chris Morgan moved on to other projects, leaving the future of the Dark Universe in doubt. ^ Vieira, Mark A. (2003). Hollywood Horror: From Gothic to Cosmic. New York: Harry N. Abrams, Inc. p. 98. ISBN 0-8109-4535-5. ^ "The Wolf Man (1941) - Rotten Tomatoes". Rotten Tomatoes.com. Flixer. Retrieved 13 July 2018. ^ Leonard Maltin (3 September 2013). Leonard Maltin's 2014 Movie Guide. Penguin Publishing Group. p. 1572. ISBN 978-1-101-60955-2. ^ Steven Jay Schneider (2013). 1001 Movies You Must See Before You Die. Barron's. p. 169. ISBN 978-0-7641-6613-6. ^ Dreastone, Carl (1977). The Wolfman. New York, NY: Berkley Publishing Group. ISBN 978-0425034460. ^ Fleming Jr., Mike (July 16, 2014). "Universal Taps Alex Kurtzman, Chris Morgan To Relaunch Classic Movie Monster Franchises". Deadline. ^ Fleming Jr., Mike (November 12, 2014). "Will Justin Lin Rev 'Fast & Furious' Finale?". Deadline. ^ Fleming Jr., Mike (November 12, 2014). "Sony Confirms 'Dark Matter'; Universal Confirms Aaron Guzikowski To Write 'Wolfman'". Deadline. ^ Fleming, Jr, Mike (June 22, 2016). "Dwayne Johnson Sets Jay Longino Graphic Novel 'Son Of Shaolin' At Sony". Deadline. ^ Ford, Rebecca (October 13, 2016). "Universal Taps 'The Expendables' Writer to Pen 'The Wolf Man' (Exclusive)". The Hollywood Reporter.